Composting is necessary if you want to have rich fertilizer handy for your plants and veggies. It is simple and you can apply these five different methods. It does not matter if you are taking care of a big farm or you just have a little kitchen garden in an urban residence. Composting can be done in big spaces as well as in small areas. You just need to apply these simple methods. Actually, every single day, we have tons of garbage from our foodstuff. Just imagine, billions of people in the world have full trash bins at the end of the day. So the idea of composting is a brilliant thought that we should all be doing. Someone who started to collect food scraps from restaurants was able to save around one hundred eleven tons of food waste and he was able to turn it into magnificent nitrogen rich compost! This is really motivating, isn’t it? Basic Composting – from the word basic itself, it is an uncomplicated method of composting. A space of about twenty five sq. ft is enough for the pit. Put some layers of organic materials like dried leaves and bark, and then put some grass cuttings and veggie scrapings. Then top them with soil. Keep on adding the layers until it reaches at least four feet high. And for basic composting, take care that it does not turn wet, it has to be kept moist. Bin composting is also called as the “no turn” technique. It has similarity with basic composting. You will be adding layers but for bin composting, you need 3 bins for this method. You have to continue adding layers to the first bin until it is filled. You can then move on to the next bin. This bin composting is a very long method and it may take three years to decompose. Quick composting is for those who have no patience to wait. You can simply combine basic composting and bin composting. Alternately, use basic composting and bin composting two times a week. Make sure that the pile stays warm. Trenching is a method of composting by excavating a ditch of approximately three feet deep and pouring it with scraps, layering them with soil. Wait for about two to three months for the scraps to decompose and you’re ready to start your vegetable garden! Worm Composting is ideal for small spaces like those who are living in urban areas. You can have the most fertile soil compared to other composting methods. Make use of red wriggler earthworms for they can break down foods scraps into mouldings while nutrient rich worm tea is good as an organic fertilizer. But worms cannot be fed a lot of food in one go and you must try to avoid any citrus type of food, onion family and meat. This method is also not very smelly as compared to other composting methods. 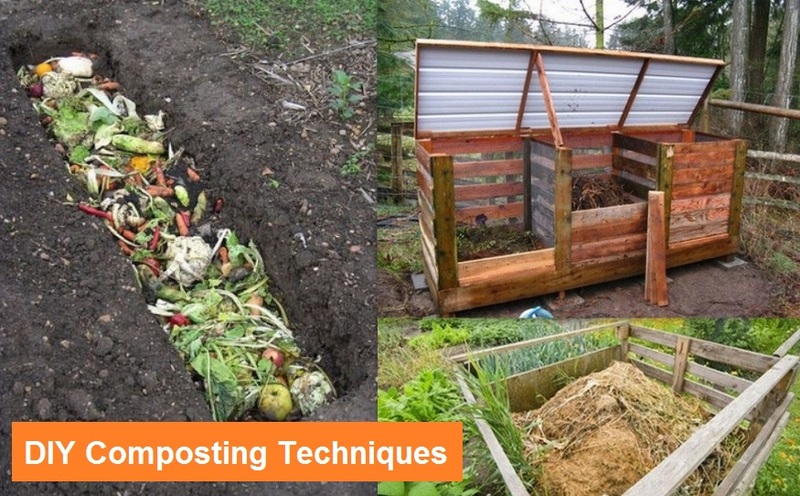 Choose the best method that fits your space and follow the simple instructions for your DIY composting technique. Next Article No Bread Sandwich Ideas!